HylasOne is the first satellite for Avanti Communications and is scheduled to launch in March of 2009. Incorporating the latest satellite technology, HylasOne has been designed to provide two-way data communications for a number of market segments, including home and enterprise broadband to non-terrestrially served areas, government and media networks. In the mix will be a distribution channel for IPTV plus a Ka-band interactive TV return channel. HylasOnes unique characteristics reduce the overall operating costs of satellite services, both in the bandwidth and the hardware that is required. A flexible combo of ultra-high speed corporate networks, two-way broadband access services, IPTV platform distribution and Ka-band Interactive TV return channel will be delivered. The satellite will be positioned at 33.5° W and will features both Ka- and Ku-band wide beams, using Ku-band BSS spectrum. Based on ISRO I-2K Platform, which has a 22-year in-orbit history, the satellite will have a launch mass of 2300 kg with 2KW payload power and a 200 kg payload. HyalasOne is expected to have a lifetime service of 15 years. Some of HylasOnes key features include competitive pre-launch rates, very small, low cost antenna operations (e.g. only 45cm DTH antenna), with only 66cm VSAT terminals being required. Due to circular polarization of Ka-band, theyll be easy antenna pointing. Additional options will include flexible satellite coverage, bandwidths available up to 740 MHz on a single beam, and, on some routes, broadcast mode from one beam to team beams. VNO (Virtual Network Operator) platform operations will also be available and theres going to be automatic level control on the transponders to compensate for rain interference. As far as applications are concerned, there will be 250+ DTV channels; 320,000+ broadband users; triple play of voice, Internet and TV as well as access for transportable/mobile use. The satellite coverage will encompass 22 countries in western and central Europe. EADS Astrium received the contract to build the satellite, the first contract to include the companys latest communications payload technology, Generic Flexible Payload and Next Generation Antenna (allows flexibility for bandwidth and channel assignments, with capacity tailored to meet changing demands). In fact, this satellite will also be a flight demonstrator for the technology. The ISRO I-2K small satellite platform will be used, becoming the second order under the cooperative agreement between EADS Astrium (communications payload) and ANTRIX/ISRO (satellite bus, integration and testing). Antrix is the commercial arm of the Indian Space Research Organization (ISRO). 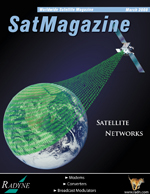 HylasOnes satellite control services will be handled by Inmarsat under a five-year contract. This is also a first for Inmarsat, providing real-time operational services for a third-party. The control system to be used is the same one Inmarsat uses to support their own fleet of 10 satellites. Avanti Communications is a United Kingdom-based firm that supplies satcom services to a variety of business and residential customers and they also offer consultancy services that have been contracted by national governments, corporations and European agencies. The company will be new to the satellite operations business, but they already have 10 years of experience in the satellite indsutry, with commercial delivery to BNSC, ESA and EU projects. The firm currently operates a DVB-RCS platform for data network services throughout Europe with Intelsat coverage on IS-903. investing HylasOne are the British National Space Centre (BNSC) and the European Space Agency (ESA).